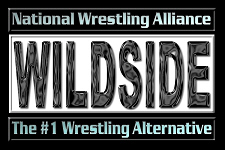 Collect the greatest events from NWA Wildside on DVD! TWO Item Special! Any two DVDs for $14 USD which includes Domestic shipping or $19 with International shipping! Single items are available at $8 USD which includes Domestic shipping and $13 with International shipping! Write to Show Business, Inc at ShowBis@aol.com for info on how to order by mail and on how to order any of the over 300 episodes of NWA Wildside TV. Any TV episode may be purchased by using your PayPal account and using the "Send Money" option to showbis@aol.com. Costs are $5.00 for 1 show or 3 shows per DVD for $10.00. Special events are are $10.00 per event or two events fr $15.00, shipping included! International orders please add $5. Copyright © 2010 Show Business Inc.